HTC's kicking the Windows Phone 7 era off in style today with no less than three new phones scheduled to debut on October 21 in Europe: the HD7, the 7 Mozart, and the 7 Trophy. Both the Mozart and Trophy offer a WVGA LCD screen, a 1GHz Qualcomm MSM8250 chipset, 576MB of RAM, 8GB of built-in storage, and 720p video recording. Where the 7 Mozart sets itself apart is in having an aluminum unibody construction wrapped around its 3.7-inch display, together with a more advanced 8 megapixel imager and a Xenon flash. The 7 Trophy makes do with an LED flash illuminating 5 megapixels' worth photons, but it does also come with HTC's promise to be the most aggressively priced WP7 handset from the company. It'll be a Vodafone exclusive across the big red network's global footprint, while the Mozart will be exclusive to Orange in the UK, France, Spain, and Switzerland, exclusive to Deutsche Telekom in Germany, and available on a choice of carriers elsewhere. No peep of an American release for either handset, however. 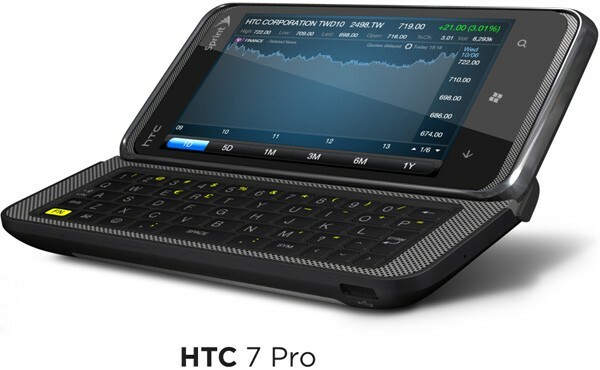 For the home crowd, Sprint is set to deliver a HTC 7 Pro with a QWERTY keyboard that slides out and tilts -- you can see it pictured in the gallery below -- at some point in the first half of 2011. It too goes with the same old 1GHz Snapdragon, 576MB of RAM, 5 megapixel cam plus 720p video, and WVGA display resolution (on a 3.6-inch screen), but it gets a bump in storage to 16GB. 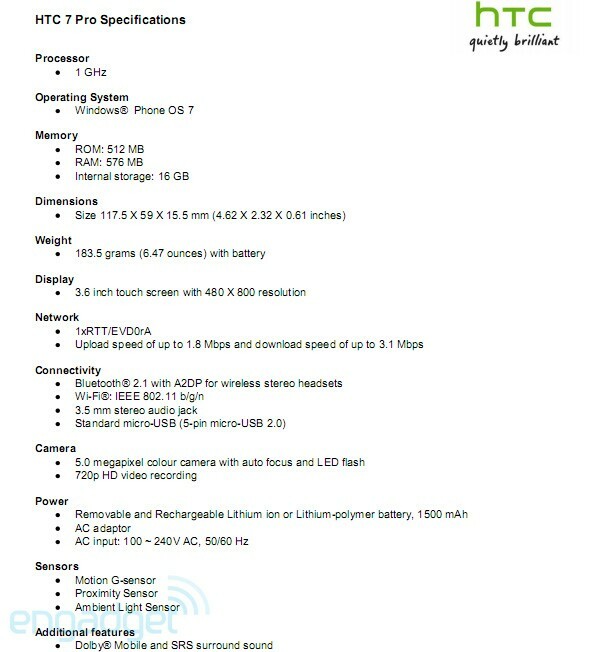 Full spec sheets for all three phones, along with HTC's big Windows Phone 7 announcement, await just past the break. NEW YORK – October 11, 2010 – HTC Corporation, a global designer of smartphones and long-time Microsoft partner, today unveiled five new Windows Phone 7 smartphones: HTC 7 Surround, HTC 7 Mozart, HTC 7 Trophy, HTC 7 Pro and HTC HD7. This strong and diverse family of phones features Microsoft's new Windows Phone 7 platform and embodies the stand-out design and innovation for which HTC has come to be known. Each new phone includes a variety of cutting-edge technologies and a series of unique HTC applications that can be accessed through the new HTC Hub that complements the Windows Phone 7 Hub and Tile experience. surround sound experience because the HTC 7 Surround speaker makes the listening experience natural and comfortable. HTC HD7 owners can enjoy their favorite videos and movies in cinematic-style thanks to the large 4.3" high-resolution screen, while its kickstand allows them to sit back and enjoy the action handsfree. For those who refuse to compromise on their mobile gaming experience, the HTC HD7 realizes the power of Xbox LIVE,bringing gameplay to life in a way that takes console gaming beyond the home. • HTC 7 Surround will be available exclusively in the United States with AT&T as the HTC Surround. • HTC HD7 will be exclusively available in the United States with T-Mobile. 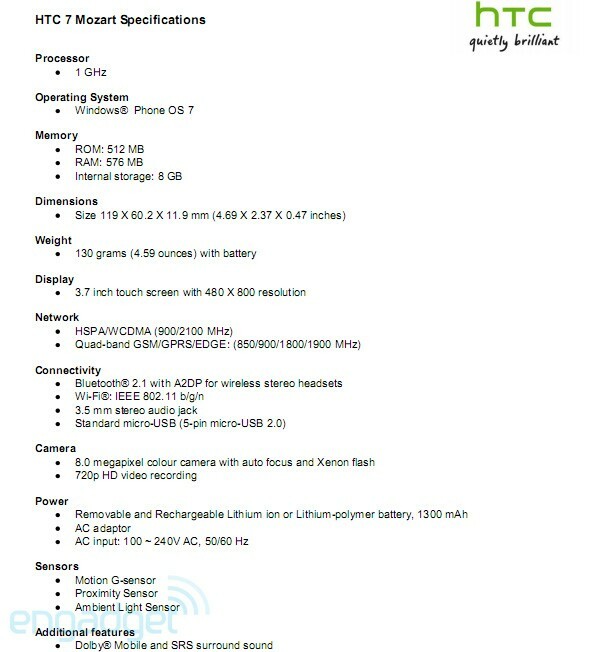 • HTC 7 Pro will be available in the first half of 2011 with Sprint. • HTC 7 Surround will be available exclusively with Telus in Canada. • HTC HD7 will be available from Telefonica O2 in Germany and exclusively in United Kingdom and Ireland. • HTC HD7 will also be available with Telefonica Movistar in Spain. • HTC HD7 will be available from Bouygues Telecom in France. • HTC 7 Mozart will be exclusively available in France, United Kingdom, Switzerland and Spain with Orange. • HTC 7 Mozart will be exclusively available in Germany with Deutsche Telekom AG. • HTC 7 Mozart will be available in Austria with Deutsche Telekom AG. • HTC 7 Mozart will be available in Austria with Orange. • HTC 7 Trophy will be available exclusively in Germany, France, Spain, United Kingdom, Austria and Switzerland with Vodafone. • HTC 7 Mozart and HTC HD7 will be broadly available in Italy. • HTC HD7 will be exclusively available with Telecom New Zealand. • HTC HD7 will be exclusively available with Singtel in Singapore. • HTC HD7 will be exclusively available with Maxis in Malaysia. • HTC HD7 will be available with Taiwan Mobile in Taiwan. 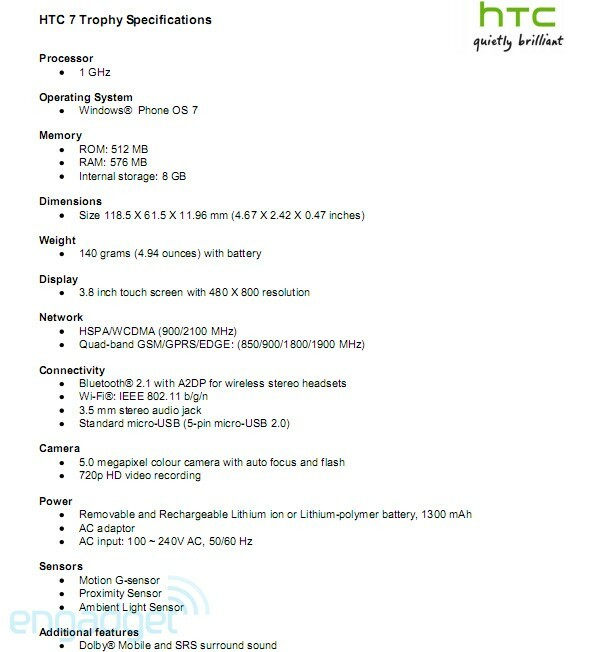 • HTC HD7 will be available in Hong Kong with CSL, 3 and China Mobile. • HTC 7 Mozart will be exclusively available with Telstra in Australia. • HTC 7 Mozart will be exclusively available with Starhub in Singapore. • HTC 7 Mozart will be available in Hong Kong with CSL, 3 and China Mobile. • HTC 7 Mozart will be available with Chunghwa Telecom in Taiwan. • HTC 7 Trophy will be exclusively available with Vodafone in Australia and New Zealand. • HTC 7 Trophy will be exclusively available with M1 in Singapore.